A 19th Century Mahogany Writing Table. The table with broad cross banded edge surrounding the leather gilt tooled writing surface. the edges of the top with slightly rounded quarter cut facings, above the frieze with a long drawer mounted with lion mask ring handles and a circular escutcheon. The table standing on four attractively decorated outward spiralling legs, tapering to ringed and shaped feet. The whole in well figured mahogany. Height 29 inches, width 38 inches, depth 22 inches. 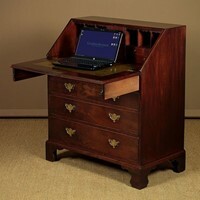 George III Mahogany Writing Bureau c.1790.